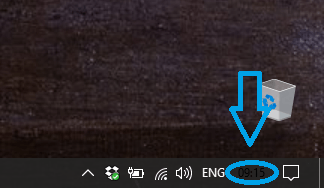 For a few users of Windows 10, the Clock in the taskbar is showing up in black color. This is in contrast to its default white, which has been the default for Windows for over a decade. As you can see in the image below, the clock is clearly (pun intended) not visible. With dark backgrounds, the text is not normally visible. I had this bug me once in Windows 10 on a VM running inside VMware, but restarting the explorer.exe process fixed it. Restarting the explorer doesn’t always work, though. It looks as of now, there is no permanent solution to this atrocity. With gazillions of errors showing up while using Windows, it looks as if the quality control with this OS is very ho-hum. At least, sort of. However, don’t’ worry fellas. After a lot of messing with the personalization and color settings, I have finally figured a temporary solution to this problem. The two triggers for the change in clock color are app theme (light or dark) and the toggle for task button size. Messing with these settings makes the black color go away. You can mess with these settings yourself to see if any of them works for you. Continue below for the instructions. Open the Taskbar properties. For that, right-click on the taskbar and select Settings. Alternatively, this setting is also available from the Settings app > Personalization > Taskbar. In the Taskbar settings, first, turn on the “Use small taskbar buttons” and then turn it off. For some people, this fixes the problem. However, many others are saying that changing the option to its default makes the clock black again. When that happens, you can try disabling the dark theme in Windows. You need to turn off the dark mode in the personalization settings for making the clock visible again. Here’s how to do that. Go to Settings app > Personalization > Colors. Select Light in the “Choose your app mode” selection radio button. After applying the light theme, the clock should show in its original white color. Unfortunately I tried all of your recommendations and the clock is still not visible (it’s still black, and my theme is set to light. Go to the Settings > Personalization > Theme > Theme Settings. Try changing themes that are available on your PC. Try something like Flowers or Aero Lite. This might work. This trick worked on me. Thanks! That worked – thank you! Hi thanks for the help! Turning off small Use small taskbar buttons worked. I was missing my clock visibility since the Anniversary Update. Turning off “Use small taskbar buttons” does work, but… I want small taskbar buttons. So it doesn’t work so much as change something else. Thanks, this has been annoying me to no end! Thanks! As you suggested, I turned OFF the “use small taskbar icons”. It had been in the “on” position. For me, that instantly changed the clock and date font to white so it’s now visible again. I don’t mind the taskbar icons being a little larger. So, I figured it out and this happends to be in the newwest update in settings, personalisation, Themes Settings, I think it was a cloud saved Windows 10 Pro Altum theme settings to have the date and time in black if you change your theme settings back to your os custom theme it should go back to normal in white. Thanks v much, turning off and on “small task bar buttons” worked for me, my problem started after the latest biggish windows update (Jan 2018) the task bar clock suddenly faded to almost invisible, which was annoying but at least it was still there…then it disappeared completely and I restored it by right click on task bar/settings/ then turn off “Show badges on task bar buttons” it popped right back up. Yay, my clock is back and now, thanks to this fix, it’s in white text so I can read it. Thanks everyone!